A short entry for a title which seems to have a C64 connection, but we’re not sure if it is a red herring just yet. 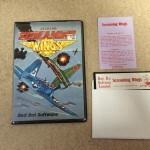 Thanks to John Christian Lønningdal, we have learnt that the 1942 clone – Screaming Wings, has Atari/CBM indicated on the front cover. However, the instructions do not show any evidence of a C64 game. Is it possible that a c64 version was produced at some stage, but maybe removed due to Elite having the licence to 1942 on that platform? Early days, but we hope to hear from someone from Red Rat Software to confirm more details! Don Rigby FB page if you want to try asking him? Dual Cover probably ‘drawn up’ when game was at the planning stages maybe?. It was nothing special on the A8, but there at least it did’nt have the competition of Elite’s 1942. A8 version was coded by Don Rigby, i think, not sure if that helps?